The new heroes of Gotham City (Gotham and Gotham Girl) have had their minds completely corrupted by Hugo Strange and Psycho Pirate. As Batman tracks the superhero Gotham, wading through destruction in the process, Alfred and Duke look after Gotham Girl, as she struggles with her mind being altered. Within the first few pages, you have to wonder, what other carnage can Strange cause? What does the government have to do with all of this? The issue, entitled “I am Gotham Part Four,” written by Tom King and penciled by David Finch, begins with severe bloodshed: the death of 27 soldiers. King delivers several groundbreaking moments and moves the reader from blockbuster to blockbuster moment throughout the issue. As Alfred and Duke gather information and transfer it to the Bat computer (while offering aid to Gotham Girl) Batman briefly confronts Gotham. Let’s just say the conversation does not go well, as Gotham smashes the Batmobile. With the information received, Batman is able to track the secret location of government agent Amanda Wallers. Here, we discover Gotham (the superhero) is out of the control of the government as the Suicide Squad will be called into action out of desperation. 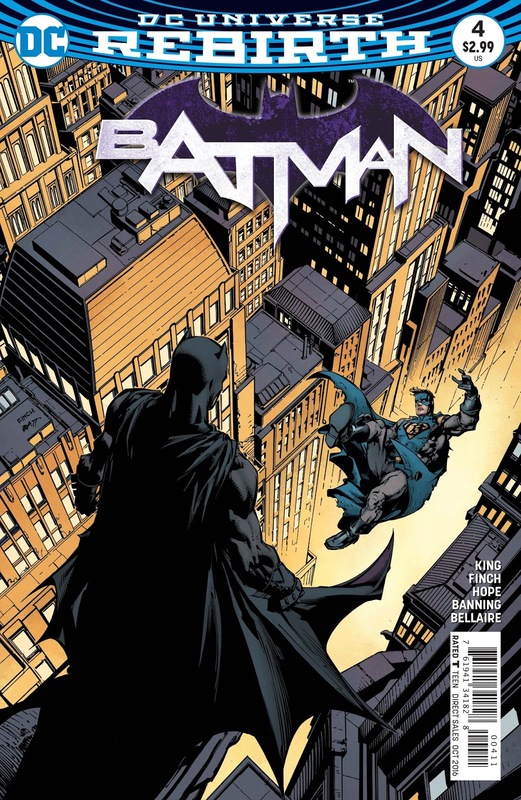 The issue ends with Batman confronting Gotham again just before Gotham breaks the neck of another soldier. 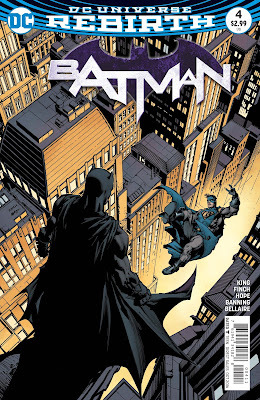 King does a wonderful job creating another terrific Batman story-arc with “I Am Gotham.” He begins this issue with a bloodbath, which instantly captures the reader’s attention. Not too much happens in this issue, but King is successfully able to move the reader along, and left me feeling fulfilled. Protecting the city of Gotham seems to be a consistent theme in the DC Universe Rebirth. How long will it take for a new hero to fall or to have their minds enslaved? Not very long, as this story-arc proves. In addition, King seems to be involving some form of governmental control. 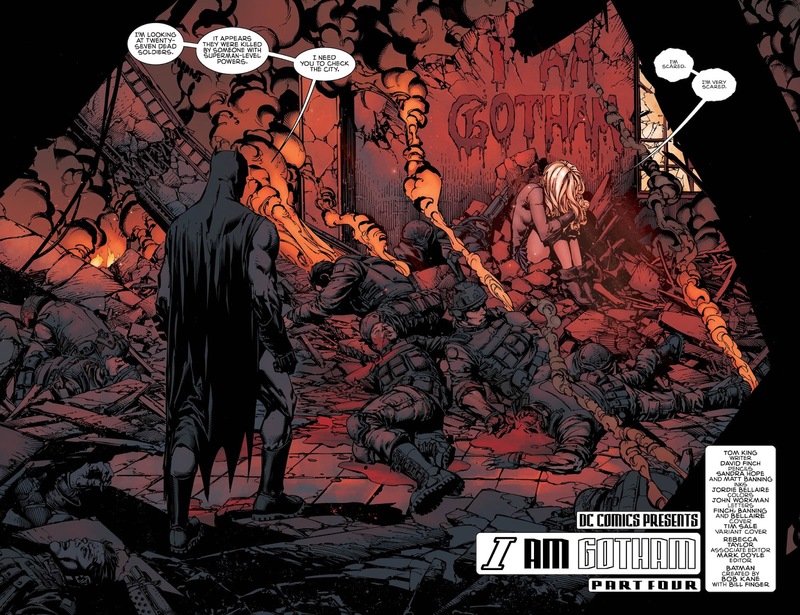 For this particular issue, the involvement of the Suicide Squad seems a bit confusing especially considering how easily Batman is able to decipher their involvement. Tom King and David Finch do a seemingly effortless job of bringing the reader into the emotions of the characters in this issue; you really endure their internal conflicts. I had to read the entire story-arc to fully understand the depth of this issue. THE VERDICT: I 100% recommend this issue and this entire story-arc. 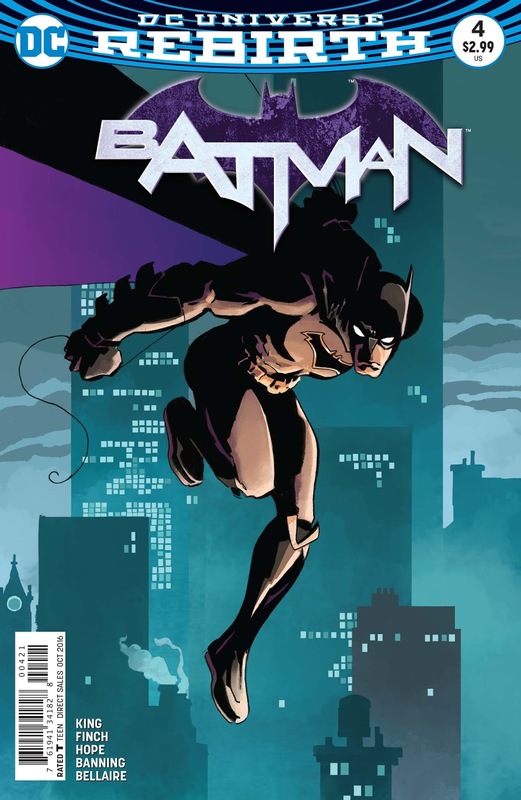 It offers compelling artwork that allows readers to become part of Batman’s epic journey. It is really thoughtful in how King blindsides his readers with surprises and twists. Can’t wait for the action to continue in issue #5!